Everyone needs a basic tee in their wardrobe. Wear it with jeans, wear it with a causal skirt--- you always need it! Basic tees are really easy to make, usually only needing about 1 yard of fabric. 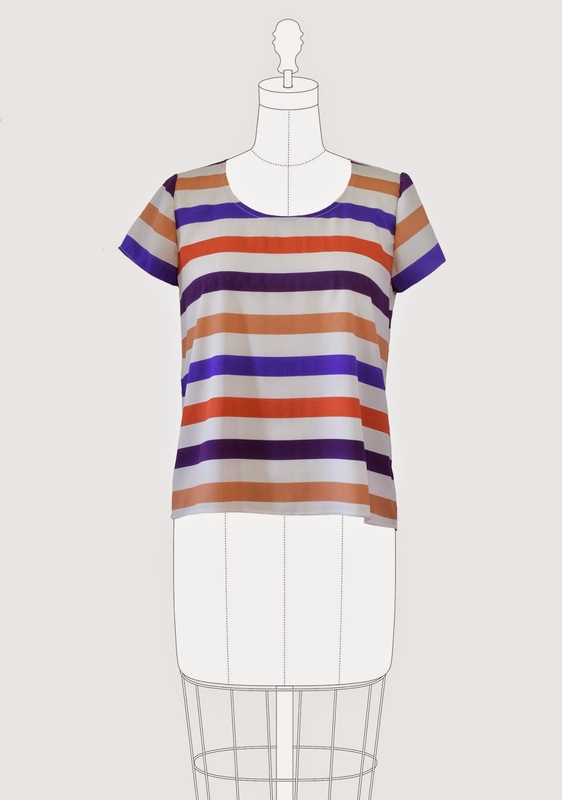 To start off our Challenge, I'm challenging our contestants to create a basic tee using the Scout Tee by Grainline Studio. Grainline Studios offers a great selection of basic patterns for everyday wear that are fashion forward and modern. But wait! There has to be a catch, right?! You can't just use the pattern exactly as shown! I don't want to see a basic tee using just one fabric with no embellishments, alterations, changes, etc. I want to see tees using the pattern as your base, but use your sewing creativity to alter, modify, embellish and/or create something unique! Sure, you can use just one fabric on the tee, but maybe you need to do something to the pattern to make it unique. Embellish your heart out, but remember to make it something you want to wear! Does that make sense? So that's it! Craftsmenship - Did you put a lot of care into the construction? Top-stitching straight, careful overall construction, etc? Creativity - Did you think outside the box and create more than just a tee using one fabric and the basic pattern with no "changes"? Presentation - While we totally understand not everyone has a professional camera and the perfect backdrop for photographing their creations, (Me included!!) you are in front of a world of other sewers! Make yourself look presentable. Submit a photo of the front, back and side view of the garment, as well as a "presentation photo" (this should be the best photo!) Detail photos are also requested so we can be better judges. So if you do some embellishing or a specific technique, zoom in and share with us! Tell us about your top. Tell us the process. What inspired you? How will you use this in your wardrobe? The Guest Judge will be Shannon, winner of the 1st Fabricista Fashion Challenge! Entries are due by Tuesday, September 9th, with viewer judging on Wednesday, September 10th-Thursday, September 11th. The winner will be announced Friday, September 12th and a new challenge will begin! The winner of the 1st challenge will receive two Free patterns of their choice from Grainline Studios. OK, I just printed out the pattern, now to put it together and try to make something fun!